I'm a firm believer that you cannot change your life without getting out of the house. And that inspiration can be found in the most unlikely places. Kiki Kienstra told Studio 360 how a kid's animated movie was the catalyst she needed to jump start her settled career. One day, on a whim, she saw Finding Nemo, a Pixar movie about a clownfish named Marlin on a quest to find his missing son. 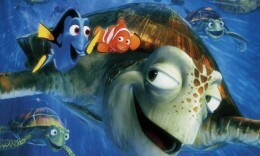 At one point, Marlin and his traveling companion, Dory, find themselves inside a whale. They must decide whether to continue to cling to the whale’s tongue or let go and face an unknown future. “I realized when I saw that scene that I needed to make a decision about my life,” Kienstra says. “Just staying in my life — just hanging onto the tongue — I wasn’t doing anything. I needed to let go of the tongue and see what happened.” When she let go, Kienstra packed up all her things and followed her dream to teach in a foreign country."